Great Strides In Self-Confidence . . .
Isn’t this what you’ve been waiting for? A book that moves away from the typical, basic methods while focusing on the most effective, easiest ways to enhance your child’s self-confidence and achievement for the most gain possible. If you answered "YES" to any of the above issues, don't wait to buy this book! Dr. April, anxiety/stress expert and psychologist, offers guidance that actually works, taken straight from his experience working with parents and children for over 20 years. Why invest good time and money on activity after activity, coaching, or even counseling, if you can follow these easy tips and techniques I’ve given to manage your parental stress by easily helping your child make quick phenomenal gains? Completely Changed My Son's Behavior . . . If you want a child brimming with self-confidence, a child with amazing social skills, strong frustration tolerance and impulse control, a child who knows their strengths, rises to the occasion to face challenges, and consistently achieves while quickly set up for future success then . . .
this might be the most important, most valuable letter you’ll ever read! In my book, I teach you my top-secret strategies based on over 20 years of working with children – first as a swim teacher and pool manager, then as a developmental researcher, then with my masters in psychology and finally for the past 12 years as a Ph.D. and licensed psychologist. Each strategy is laid out step by step in a clear, concise manner. No unnecessary filler. Just right down to it. You won’t find these strategies in any other book because my book does not go over the same old tired information written in book after book by therapists and the like suggesting that you constantly tell your child how much you love them, how special they are and that you should praise them relentlessly. Don’t get me wrong. These things are nice and good, but THEY DO NOT BUILD SELF-ESTEEM! Reducing your parent stress by improving your child’s self-esteem, security and success requires my specific focused strategies that, although easy to follow, are unfortunately not being taught by others around the globe. Not long ago, I became frustrated with seeing the same old generic information out there as I was fully aware that my methods have enabled me to reduce parent's stress and help hundreds of children improve their self-esteem while paving their road to greater happiness and achievement. My frustration finally led me to write this book to share my strategies with as many parents as possible. I’ve filled this book with my most effective strategies, tips and techniques that I’ve helped hundreds of children with for over 20 years in a variety of capacities and settings including hospitals, elementary/middle/high schools, clinics, universities, different communities and in my own private practice and treatment center. I’ve helped hundreds of children and parents and can help you too! All that I’ve provided in this book comes directly from the specific work I’ve done with previously stressed out parents that has led them to stress reduction, terrific results and quick turnaround for their children. I have included only that which has been most effective – and nothing else! No unnecessary filler! Why waste time? Building your child’s confidence could take years with costly trial and error, expensive activity after activity, or weekly private-hourly sessions in therapy. I am providing you a solution with quick and easy strategies you could have in 2 minutes – for dirt cheap! And this is an exclusive offer! In this book you will learn the top-secret strategies that I have previously shared only with parents during private sessions they were attending in my office. I truly doubt you’ve ever heard or read about any of my specific strategies on building self-esteem or enhancing your child’s success in other books or from others who work professionally with children. *. . . and more! “Stress-Free Parenting: Top Secret Strategies To Skyrocket Your Child’s Self-Esteem, Security and Success – Without Breaking The Bank!” is based on Dr. Craig April’s over 20 years of work with children and parents. this book for nowhere near what it’s worth? 1.) Because my goal is to simultaneously help as many parents as I can, rather than simply working with one family at a time. 2.) Because there is no cost for me to produce a hardback copy and send it. By offering this in the form of an e-book, it means you can easily download it and be reading it 2 minutes from now. Even if it’s 3:00 AM in the morning! And the best part is you get instant access to "Stress-Free Parenting: Top Secret Strategies To Skyrocket Your Child’s Self-Esteem, Security and Success" as soon as you press the download button. No driving to a bookstore, no searching for a book in a sea of books, no standing in line to pay for it and no drive to bring it back home. And if you respond right away, you pay the introductory price of only $12.95! That’s only an average of 1 dollar for the next 10 days for the opportunity to reduce your parenting stress and skyrocket your child’s self-esteem, security and success –possibly for his or her entire lifetime! And you’ve got a full 60 days to try it out – risk free! That’s right. 60 full days to read, apply my secret strategies and experience results. Plus, if you buy Now, you’ll also get my . . .
You can schedule one free private 20-minute phone session with Dr. April to discuss any area of concern you have regarding your child. During this call, Dr. April will give you at least one great tip that you have never tried that can assist you in helping your child resolve a current problem or area of concern. (over a $70.00 value FREE!) (The basic code # to set up your appointment anytime in the 60 days following download is provided on the last page of this book). Act Now and You’ll receive my book and these bonuses for only $12.95! But only if you act now, because this is an introductory price that will increase shortly. I can’t give my secret strategies and these great bonuses away like this for too long! 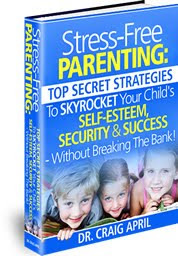 You’ll get my book “Stress-Free Parenting: Top Secret Strategies To Skyrocket Your Child’s Self-Esteem, Security and Success – Without Breaking The Bank!”, my Top 17 Tried and True Way To Build Your Child’s Self-confidence Now!, and one FREE private 20 minute phone session to schedule over the next 60 days following download. You can’t lose with this guarantee! Based on my years of working with hundreds of parents, I am so confident you’ll benefit, that if you don’t see a huge boost in your child’s self-esteem, security and success, just contact me any time within 60 days after downloading this incredible book and I’ll refund 100% of your money, in full, with no questions asked! (just email me with “refund” in the subject line and you’ll be sent a prompt, courteous refund thanking you for being an admirable parent interested in your child’s happiness and success!) –my email address is at the bottom of this page. With SECURE ORDERING, once your credit card is approved, you will be sent a private email with a download button where you can get your copy of “Stress-Free Parenting: Top Secret Strategies To Skyrocket Your Child’s Self-Esteem, Security and Success – Without Breaking The Bank!" along with your FREE amazing Bonuses. Buy NOW - Click Your Child's Self Esteem To Get Your Copy This Minute! P.S. – This e-book will soon be sold for $25.95. This current introductory price of $12.95 will only last for a short time. So act fast! I don’t want you to miss out on this special price. You’ve got your child’s skyrocketed self-esteem, security and success to gain and absolutely nothing to lose. Copyright 2008 - 2010, Craig April, Ph.D. All Rights Reserved. The author has provided this book for informational purposes only. The information in this book and on this website in no way substitutes for or represents any form of treatment for psychological, emotional, behavioral and physical syndromes or disorders. Appropriate licensed professionals must directly evaluate, diagnose and treat symptoms of physical or mental health conditions.